Saint Nicholas was born in the third century around 275 AD in Patara, a village on the southeast Lycian coast on the Mediterranean Sea in what is now Turkey. There existed in Patara an early Christian community which was likely started by the Apostle Paul when he and Luke were there on Paul’s third missionary journey to Tyre in the first century. Three miles from Patara is the capital of Lycia called Myra, which was the seat of a bishopric founded by St. Nicander. He would use his inheritance to help the desperate, the sick, and the suffering as is evident from the story of one of his his first and most well known deeds. A citizen of Patara had lost all his money and his three daughters could not find husbands because of their poverty. In these times, a woman was expected to give her prospective husband a dowry. Michael said, “They were so poor that no man of their order wanted them as his wife. Not even men of lower rank thought about marrying them. Therefore, their father thought about ordering them to work in a brothel, so that he and the family would have some income.” When Nicholas heard of this, he took a bag of gold and at night tossed it through an open window of the man’s house. The daughters had been washing clothes that evening and they hung them on the fireplace to dry. Nicholas’ bag of gold landed in one of the stockings. Here was a dowry for the eldest girl, and she was quickly married. Nicholas did the same for the second and then for the third daughter. On the last occasion the father was watching by the window, and overwhelmed his young benefactor with gratitude. This led to the current custom of hanging stockings or putting out shoes for gifts from Saint Nicholas or Santa Claus depending on what country you are from. Sometimes the story is told with gold balls instead of bags of gold which is why three gold balls (sometimes oranges) are seen in pictures of St. Nicholas. It is also why sometimes you will see three gold balls on the signage of pawnbrokers, of which Saint Nicholas is also their patron. Whenever he helped anyone he did it secretly, so that only God would know, as he did not want praise from people. He was soon suspected to be behind a large number of other anonymous gifts to the poor, using the inheritance from his wealthy parents. After he died, people in the region continued to give to the poor anonymously, and such gifts were still often attributed to St Nicholas. In the year 303, Emperor Diocletian of Rome issued a series of edicts, the first one blatantly titled “The Edict Against Christians”, commanding that Christian churches should be destroyed, Christian worship prohibited, and Christian Scriptures confiscated and burned. The protection of the laws was withdrawn from Christians. Christian bishops were rounded up wholesale, imprisoned, tortured, and many put to death, while the whole power of the throne was turned loose to wipe out the rest of the Christian community with blood. The church was subjected to perhaps its worst and most dreadful hour of trial. There was no corner of the Empire where Christians were not sought out, dragged before idols, and commanded to offer incense and sacrifice or be tortured or murdered. This was called Diocletian persecution, also known as the Great Persecution, which is likely the reason for the death of the bishop that preceded Saint Nicholas. This is the tumultuous time in which Saint Nicholas was made bishop and he would not be immune to Diocletian’s edicts. He was eventually tortured and be imprisoned with the many other clergy who would not sacrifice to idols. Eusebius, a church historian, writes concerning this period, “The prisons were so full of bishops, priests, and deacons, there was no room for the real criminals—murderers, thieves and robbers.” On May 1st, 305 Diocletian abdicated his throne because of illness and was succeeded by Galerius who continued the persecution until the year 311 where he issued a edict of tolerance from his deathbed. The persecution had ceased, and in 313 with the signing of the Edict of Milan by Emperor Constantine, rights were restored to the Christian faithful and prisoners were freed. Nicholas had been confined to a small cell, and beaten raw until his skin was vermilion. Modern forensics on his skull revealed a broken nose that was likely from this period. When he entered Myra again, he was greeted by crowds of people cheering him, shouting, “Confessor!” Christians who didn’t forsake their confession that Jesus Christ is Lord were known as confessors. Saint Nicholas survived the persecutions and his popularity continued to grow because of his charitable deeds. During the reign of Constantine one of his earliest known deeds, Stratelatis,is told. It dates to around 400 AD. There was a revolt in the city of Phrygia in Asia Minor which caused Emperor Constantine to send three legions commanded by three generals (named Nepotian, Ursus, and Herpylion) to put the rebellion down. To obtain food and supplies, they stopped at the port of Andriaki, near Myra. A riot broke out between the soldiers and the merchants. Saint Nicholas came to convince the generals to control their soldiers and restore peace. He invited the generals to dine with him and they started on their way back to Myra. On the way back he was brought the news that three innocent men were about to be executed by beheading. Nicholas ran to the place and found the three men with their faces covered, hands bound behind their backs, expecting death. The executioner’s sword was up and ready to fall. At that moment, Nicholas, embodying the scripture, “The righteous are bold as a lion” (Proverbs 28:1) stepped between them and caught the sword with his bare hands, wrestled it away, and threw it to the ground. He then summoned the prefect who tried to pass the buck on to two other men named, Eudoxius and Simonides. Bishop Nicholas replied, “It is not Eudoxius and Simonides who did this, but silver and gold.”, because it was known by Nicholas that he had taken a bribe of 200 pounds of silver to execute the innocents. The prefect repented on the spot and the three men were cleared. The three generals continued on with their mission and restored order to Phrygia. When they returned to Constantinople they were greatly rewarded and were also greatly envied by their rival officers. The rival officers spread lies, claiming the three generals were actually part of a plot to animate the Emperor. These lies were believed and the three generals were scheduled to be executed. That night as the Emperor slept he was given a dream of a man telling him to release the generals immediately because they were innocent. The emperor asked who the man was and he replied, “The Bishop Nicholas of Myra, a sinner; God has sent me to tell you to free these men without delay.” The same dream was also given to the prefect. In the morning the Emperor and the prefect told each other each’s dream. They then approached the accused and asked them is they knew anyone by the name of Nicholas. They were immediately uplifted in spirit and told the Emperor about Saint Nicholas and what he had done for the three innocents in Myra. Hearing their story, he released them, and commanded that they give gifts to Nicholas, which were from Constantine. They did as they were commanded and thanked Saint Nicholas for saving them, but Nicholas told them not to thank him, but God, the one who truly saved them from death. Emperor Constantine had legalized Christianity, the Great Persecution had ceased, but all was not well in Christendom. A heresy had been forming that was beginning to gain a following: Arianism. Arius, a priest from Alexandria, was teaching a doctrine that denied the Trinity and the divinity of Christ. He taught that Jesus Christ was not equal to the Father by nature, but is the first creation of God. Rather than Jesus being both God and man, the Jesus that Aruis described ended up being neither-not quite God and not quite man. To resolve the issue, Constantine called the First Council of Nicaea in 325. It was modeled after the Jerusalem council in Acts, which also is known as the First Ecumenical Council. It is estimated that 1,800 bishops, priests, and deacons were in attendance. 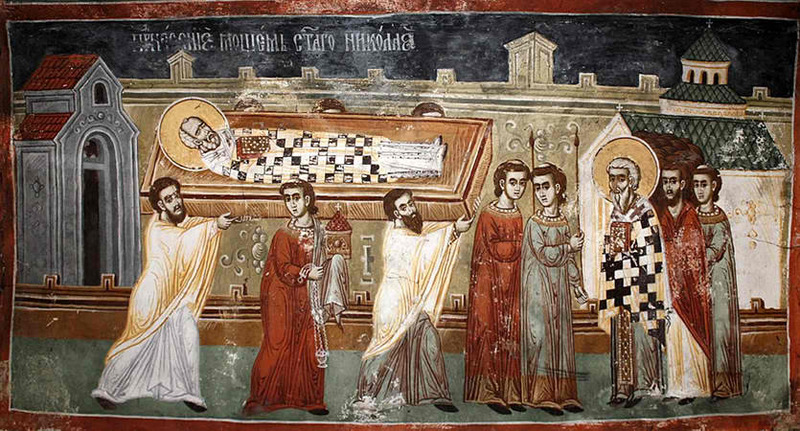 Saint Nicholas’s participation is documented by Byzantine historian Theodore the Lector. Saint Methoudius claims that Nicholas beleived Arianism to be a “death-dealing poison” and all of Myra was left untouched by the heresy because of the fervor in which Nicholas attacked this offensive doctrine. At the the Council of Nicaea, Arius presented his case before all the attendees. At some point, Nicholas could no longer tolerate the blasphemies Arius was saying against God, so he got up, walked up to him, and punched Arius in the face, knocking him to the floor. Nicholas’ fellow bishops were outraged that he lost control and hit Arius. The canons of the church forbid clergy from striking any human being, so he was brought before Constantine, who stripped him of his vestments and had him thrown into prison for what would have been the length of the council. Ashamed of his actions, Nicholas prayed to God and asked for forgiveness in the dark of his prison cell. In the night, Jesus Christ and the Virgin Mary appeared to some of the bishops, telling them that no action should be taken against him, since he had acted out of extreme love for God, rather than hate for Arius. Jesus and Mary also visited Nicholas that night. Jesus placed a book of the Gospels in Nicholas’ hands and the Virgin returned to him the bishop’s vestmenst which had been taken away. When the guard came to visit him the next morning, he was surprised to see the broken chains on the floor and the good bishop sitting, dressed in his vestments and peacefully reading Scripture. The story was immediately reported to Emperor Constantine, who ordered that Nicholas return to the Council and the full dignity of his office. This is why on many icons of Saint Nicholas there images of Christ presenting the Gospel book and Mary presenting his vestments. And in one Lord Jesus Christ, the Son of God, begotten of the Father, Light of Light, very God of very God, begotten, not made, being of one substance with the Father. Saint Nicholas would go on to perform many more miracles, to be loved by the people in and out of Myra both during his life and after his death. He died peacefully on December 6, 343, over 1,600 years ago this very day, and was buried in his city of Myra. He left behind no writings of theological works, but stories of his life are passed on from generation to generation. Although he didn’t die a martyr, he is considered saint because he couldn’t find in himself the capability to not love his neighbor and care for those in need. 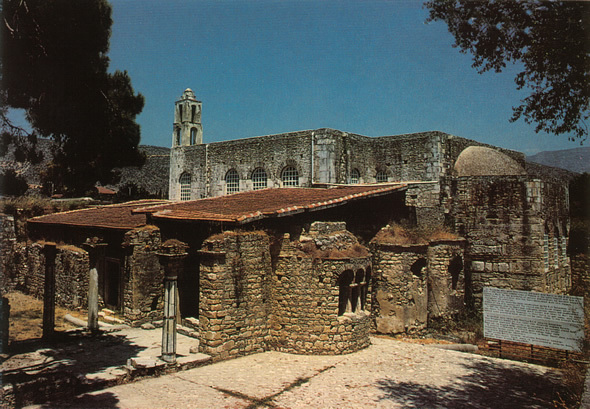 Two hundred years later, Justinian would celebrate his feast day and have a church built over his tomb. In the centuries that followed millions of people would call him their patron, of which I am one. Here is en exhaustive list of things Saint Nicholas is a patron of. The quite exceptional veneration of St.Nicholas is well known. In the liturgic weekly cycle of the Orthodox Church, among the days of the week dedicated to the Saviour and to different orders of heavenly and earthly sanctity, only three persons are singled out by name: the Mother of God, John the Forerunner and St.Nicholas. The reason for this special veneration of this bishop, who left neither theological works nor other writings, is evidently that the Church sees in him a personification of a shepherd, of its defender and intercessor. “Having fulfilled the Gospel of Christ . . . thou hast appeared in truth as a most hallowed shepherd to the world. 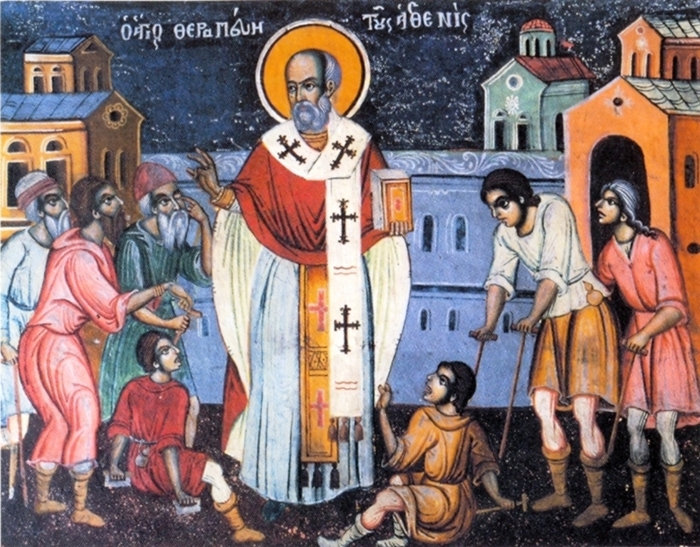 According to his Life, when St.Nicholas was raised to the dignity of bishop he said: “…This dignity and this office demand different usage, in order that one should live no longer for oneself but for others.” This “life for others” is his characteristic feature and is manifested by the great variety of forms of his solicitude for [people]—his care for their preservation, their protection from the elements, from human injustice, from heresies and so forth. This solicitude was accompanied by numerous miracles both during his life and after his death. Indefatigable intercessor, steadfast, uncompromising fighter for Orthodoxy, “he was meek and gentle in his disposition and humble in spirit”. Nicholas’s tomb became a ever increasing place of pilgrimage through the centuries, and thousands of people would come to visit it. The Emperor and Saint Justinian would build a church over his tomb as well as build more churches in Constantinople after his name. When Vladimir the Great brought Christianity to Russia, Saint Nicholas also became the patron saint of Russia. Saint Nicholas was loved during his life, but all the more after his death. In 1043 Myra was overtaken by Muslims, and there was a fear that pilgrimage could become difficult and dangerous or that the shrine might even be desecrated. 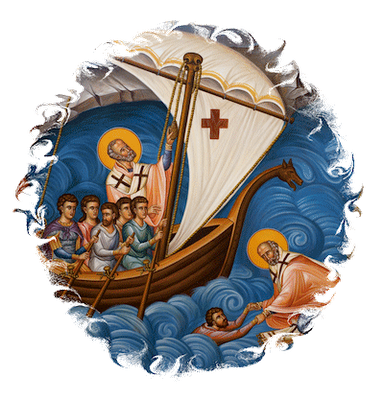 During this time, a group of merchants from Bari, a seaport in the kingdom of Naples situated on the Adriatic Gulf, sailed in three ships to the coast of Lycia (possibly under the request of the Pope of Rome) to obtain St. Nicholas’ relics. They waited for an opportunity when none of the Muslim faithful were around and entered the church in which the relics were kept. They were met by a small community of monks who showed them were the relics were. The Barians told the monks why they were there, and the monks were adamant in their opposition. A confrontation ensued which resulted in the merchants taking the relics. After the Barians left the church, the monks told the inhabitants of Myra what happened, but they were too late to stop them before the merchants had made it safely aboard the ship. They landed at Bari on the 9th of May 1087, and the sacred relics were deposited in the Church of St. Stephen for safe keeping. From the first day the relics were in Bari, people were cured of various diseases. I suppose it depends on who is telling the story if this was a good thing or not. If the merchants had not taken the body, would have the relics of Nicholas been desecrated? Was it the best thing that they be moved to Rome so that those in the West could venerate Saint Nicholas as well? 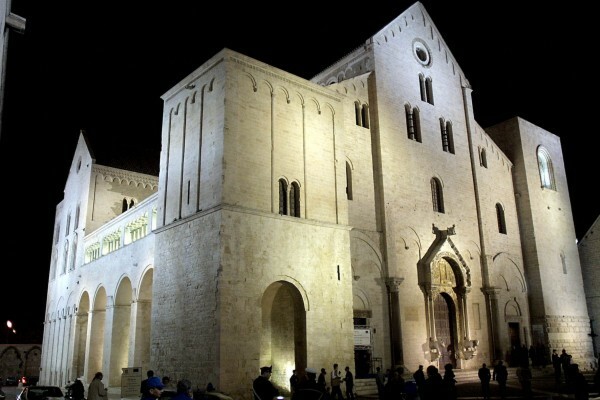 Whatever the right thing to do was, Saint Nicholas now lies in Bari and a feast celebrates the transfer of his relics to Bari is held every May 9th. This is why sometimes people call him Nicholas of Bari. A crypt for Saint Nicholas was completed by October 1089 and Pope Urban II laid the relics of Nicholas beneath the crypt’s altar. The main church was finished ten years later, but sometime before 1197 (when it was officially consecrated) the Romanesque-style Basilica di San Nicola was complete, and now holds the relics of Saint Nicholas. Oil is known to exude from Saint Nicholas’s relics called “Manna of Saint Nicholas” and is used to anoint the sick. It was known to do this in the crypt in Myra as well as the crypt in Bari. Between 1954 and 1957 when the crypt was being renovated, the tomb was opened and the bones were exhumed. The relics were placed inside an urn and were visible for three years. The bones were observed to perspire and the linen sheet which held the relics was found to be soaking wet when the relics were re-interred in the tomb. And it still does this to this day. When the bones were removed, a team of scientists was allowed to photograph and measure the contents of his crypt. In 2005, the measurements were sent to a forensics lab in England. It was revealed that he was barely five feet tall and had a broken nose (presumably from his imprisonment during the Diocletian persecution). 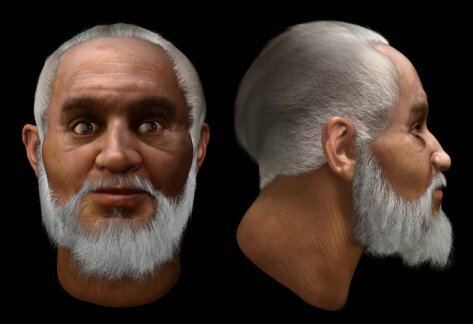 Based on Saint Nicholas’s skull, scientists have created a facial reconstruction showing what he may have looked like. After the Reformation, Martin Luther tried to squash the celebration of Saint Nicholas day, when gifts were traditionally given. He didn’t like the idea of saints and thought he day emphasized Saint Nicholas too much, rather than the true focus; Jesus. He introduced the idea of the Christ Child (or Christkindl in German) who would bring gifts on Christmas Eve when kids weren’t looking. When the Puritans and the Anabaptists came to America, they wanted nothing to do with it, so they outlawed Christmas and kept it as a work day. In fact, Congress was in session the first Christmas under America’s new constitution and Christmas wasn’t declared a federal holiday until June 26, 1870. So the first “War on Christmas” was less about being able to say, “Merry Christmas”, and more about not saying it all. Later Germans would bring the Christkindl to America and the Christmas Eve gift-giving tradition and the Dutch would bring Sinterklaas. Sinterklaas is a contracted form of Saint Nicholas, and would become Santa Claus. Christkindl would be corrupted in English to Kris Kringle, which is the “real name” of Santa Claus. Mix it all together with a bit of Americana and you get Christmas as we know it today. Despite all the changes over the last hundred years, Saint Nicholas is still here, though some have forgotten, doing what Luther claimed he wasn’t: Pointing to Jesus. The truth of things hath revealed thee to thy flock as a rule of faith, an icon of meekness, and a teacher of temperance; for this cause, thou hast achieved the heights by humility, riches by poverty. O Father and Hierarch Nicholas, intercede with Christ God that our souls be saved. Saintly One, (St. Nicholas) in Myra you proved yourself a priest; for in fulfilling the Gospel of Christ, venerable One, you laid down your life for your people and saved the innocent from death. For this you were sanctified as One learned in divine grace.